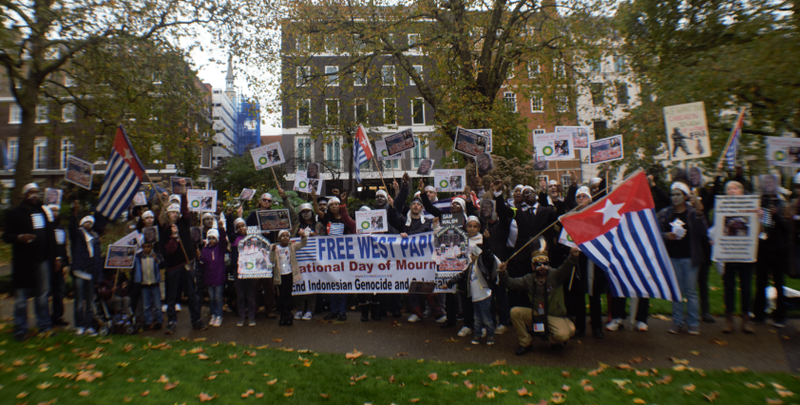 On 30th October we held a Mourning Service and Free West Papua protest in London outside the Headquarters of BP Tinto and Rio Tinto, both of which which have massive resource interests in West Papua. Many people turned out for the protest and we feel very confident that we made our voices heard. These multinational corporations are effectively funding Indonesia’s genocide and illegal occupation in West Papua by paying the Indonesian authorities and encouraging the Indonesian government to continue the exploitation of West Papua’s resources. Through shares in mining company Freeport McMoran, Rio Tinto profits from the Grasberg Mine, the largest goldmine in the world. Freeport McMoran pays the Indonesian military over 3 million dollars every year and also pumps over 238,000 tonnes of toxic waste into the local river system every day. BP is also operating directly in the middle of this secret genocide and working with the Indonesian authorities who routinely torture and kill innocent West Papuans. BP is also taking away the rights of West Papuans by banning local people from fishing in traditional areas while the company makes profit from the ongoing exploitation of the land and people. On the day, we mourned for all those who died and demanded full freedom for West Papua, delivering headstones to these corporations which have the blood of West Papuans on their hands. We would like to thank all those who came and supported this event very much. You all chose to stand up for the freedom of West Papua against colonial oppression and we are very grateful! We hope that you will all take part on the Global Flag Raising on 1st December when people all around the world will raise the West Papuan flag and show their solidarity and support with the West Papuan freedom struggle. Thank you very much, keep up the good work! West Papua will be free!